Cataract is a common cause of visual impairment in the elderly but can also affect a small number of younger individuals. A cataract is a clouding of the lens at the front of the eye. If your vision becomes consistently hazy or blurred you may have developed a cataract. 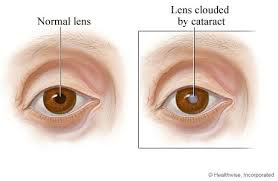 Cataract begins when some of the lens proteins become disorganised causing a small part of the lens to become cloudy and this becomes larger as the cataract progresses. 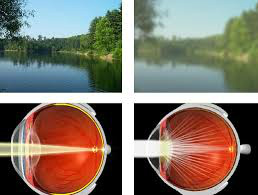 Eventually the whole lens becomes opaque and blocks off light to the retina causing a major reduction in vision. In most medically advanced countries a cataract operation is readily available allowing vision to be restored quickly. The blurring of vision is gradual, hardly affecting the sight at first. It would seem like looking through an opaque glass at times. Glare: Light from the sun, a lamp or oncoming headlights cause dazzle and in daylight colours seem faded. Patients often remark that colours are more vibrant in one eye than the other. It is best to visit an Ophthalmologist/ Optometrist if you suspect you are developing a cataract. Age: It is very common in people over 65 years of age. Despite studies, it is unknown exactly why cataracts form as the lens ages. While the factors are being gradually identified, some doctors believe that diet with high antioxidants (beta-carotene, vitamins A, C and E, and selenium) may help keep cataracts at bay. However none of these theories has been conclusively proven. Ultraviolet light – eye doctors advise the use of sunglasses and wide-brim hats to protect against UV light exposure which is suspected to be associated with cataract development. X-ray exposure – according to a 2005 Iceland study, airline pilots and astronauts are at higher risk of developing nuclear cataract due to cosmic radiation exposure. Steroids, diuretics and major tranquilisers - some of these are suspected to cause cataract but further proof is yet to be established. Steroid use in particular is associated with cataract development. Other risk factors – too much salt, alcohol, air pollution and smoking are also associated with cataract formation. Again all these processes are difficult to prove. There is evidence to show that diabetics are more prone to cataract formation. At an early stage cataract can be treated by changing the power of your glasses as carried out by your Optometrsit. This can go on for years at a time and an annual review is indicated. Later as the cataract becomes more opaque the only effective treatment is surgery. If you are a car driver then surgery is indicated at a much earlier stage than for people who don’t drive. In Ireland, a binocular vision of 6/12 and a normal field of vision is necessary for driving.